Foreign Minister Avigdor Lieberman supports lifting the siege off the Gaza Strip in exchange for Red Cross visits to kidnapped soldier Gilad Shalit and slams the opposition for its conduct following the deadly Navy raid on a Gaza-bound flotilla. Avigdor Lieberman told Ynet on Sunday that "land crossings can be opened, as long as Red Cross representatives are allowed to visit Gilad Shalit." In addition, the man in charge of Israel's foreign policy accuses the opposition for criticizing the Israeli PR efforts. Lieberman rejects the claims that he is unsuitable for his position and that he is sabotaging Israel's foreign relations. "The people who say that are miserable people who have no real or serious claim. The day of the Turkish ship affair, we were represented by Foreign Ministry officials and people we recruited 186 times across the world. As early as Thursday, before the flotilla arrived, we began assessing the situation, operating a situation room and preparing. Our estimates were completely accurate. Everything we conveyed to the prime minister and the seven-minister forum was true." And what about the failed PR efforts? "I am only the foreign minister," he says. "I am not a spokesman. I had several appearances that day. How exactly did (former Ministers) Tzipi Livni and Haim Ramon explain the Second Lebanon War and Operation Cast Lead? From what I saw, their PR led to the appointment of the Goldstone Committee. Some modesty is required here. "Throwing accusations at others is the easiest thing to do. What was the result of the Second Lebanon War with all the Winograd and Lipkin Shahak reports? I should have been accused for the Second Lebanon War and Cast Lead. I would have started there. "And what about Jenin. I haven't been blamed for that yet, for the PR failure in Jenin. But people who have failed time after time, instead of admitting that they have failed, drawing conclusions and going home, all that is left for them is to throw mud at others." We asked the foreign minister whether sending his deputy, Daniel Ayalon – who was accused of humiliating the Turkish ambassador to Israel – to explain the Israeli handling of the flotilla was the right thing to do. "We did not send Danny Ayalon to the Turkish television in Ankara," he replied. "He spoke very well, answered the questions, and he is one of the best people we have." Lieberman keeps the harshest accusations for his colleagues in the opposition. "I enraged by the attempts to make the IDF and the military operation part of the political clash," he says. "I have heard senior Kadima spokespeople, and what they are doing is crossing a red line. We have never tried to make a political gain from any military operation, whether successful or less successful. After the Second Lebanon War, when a government was in danger here and the military operation was probably not that successful, we joined the government because all political differences must be put aside." The opposition's behavior, he says, harmed the State. "There is no doubt that the lack of internal unity, without the ability to overcome impulse, in the event of a military conflict – harm the State. "I would expect that while injured soldiers are lying in hospitals, (Knesset Member) Yoel Hasson won't convene the State Control Committee to check who is to blame. I didn't see Hasson express the same enthusiasm neither after the Second Lebanon War nor after Operation Cast Lead. What is happening here is a cynical exploitation of the situation, and this makes me angry." And as the blockade on Gaza becomes part of the government's agenda, Lieberman says he will support lifting the siege. "We can open land crossings, as long as they let Red Cross representatives visit Gilad Shalit. They cannot refuse a request to visit Gilad Shalit. This is the equation. We are willing to lift the siege in exchange for regular Red Cross visits." Another issue the minister addressed was the crisis in the relations with Turkey, explaining that it is the result of "an internal Turkish process" aimed at disconnecting from secularism and turning Turkey into an empire. "We, as Jews, never want to believe what we are told," he explained. "The ideologist of the Turkish government, Foreign Minister (Ahmet) Davutoglu, wrote a book about 'Neo-Ottomanism'. They didn't just speak, but wrote an entire book. "The Turks want to renew the Ottoman Empire and bury the entire secular heritage," he rules. "No matter what we do, anything we do will be used in order to slam us, confront us, because they believe this leads to a gain in the Muslim arena and in the Arab world arena. "The conflict did not begin with this government. (Turkish Prime Minister Recep Tayyip) Erdogan lashed out at (President Shimon) Peres a long time ago, and you can see what he has said about Israel over time. There is a change in direction there, regardless of what we do." He likened the situation to the Islamic revolution in Iran. "Let's blame ourselves for Khomeini's rise to power. Iran was Israel's strategic ally, but after what happened the Iranians changed their policy. "The same direction is being taken by Turkey. At least towards Israel, it's the same thing. Now it's clear that this sail was a planned provocation. Now when you see the connection between the organization and the Chechen rebels. We saw dozens of Jihad activists board the ship separately and prepare for this conflict. The fact is that people got off five ships unharmed, and only from the Turkish one people got off the way they did." Lieberman did not forget to blast his regular punching bag – Israel's Arabs. "I am glad that everything we said during the elections, when everyone accused us of 1,001 sins, we were the ones to identify the trend before everyone else… We say things following a deep and thorough analysis, even when they are unpopular. "I saw Kadima and Likud members competing on who will present a more militant law against Israel's Arabs. We said what we said for persecution reasons, but out of a thorough analysis." According to the foreign minister, a solution to the conflict must include Israel's Arab citizens. "It's clear to everyone that these are not weeds. Israel's Arabs are part of the same thing – together with the Palestinians – and there is no use solving the Palestinian problem without solving the Israeli Arab problem. "Returning to the 1967 borders will bring neither peace nor security, but will transfer the conflict into (the Sharon region cities of) Kfar Saba and Raanana. So when you try to solve the problem, you must solve the whole thing. 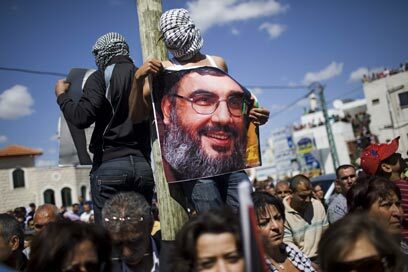 Just like we saw with (Balad MK) Hanin Zoabi, and what we saw several months ago with tens if thousands of people carrying (Hezbollah leader Hassan) Nasrallah pictures – these are not weeds." This situation, he says, should dictate Israel's policy on the diplomatic level. "We are trying to offer all kinds of solutions in a wise manner. Without a component of a territory and population exchange, the negotiations as they are being held today will not lead to any solution. It's no coincidence that since Oslo (accords) and to this day, for 16 years, no agreement has been reach. The entire conception should be changed. "I hear Kadima's hypocrisy, saying that we want to get rid of the territories in order not to be a bi-national country. This issue, and whether the State of Israel will remain a Jewish or a bi-national state, will not be determined neither in Hebron nor in Nablus. It will be determined in (the Israeli Arab towns of) Umm al-Fahm and Jaljulia. "The real argument is not about borders. I am ready for territorial concessions, when it is clear that everything is on the table, including Israel's Arabs." Lieberman rejects the claims that the Netanyahu government led to Israel's isolation on the international level, and blames Kadima once again. "I have heard many claims about how we have to act, and that because the powers of light in Kadima are not in the government, this coalition led Israel to isolation and condemnations. They must be given the Israel Prize for hypocrisy. "People don't remember, but the decision on the blockade was made by the Olmert government with Haim Ramon and Tzipi Livni," he clarified. "To come today to the government with the claim that we are being denounced because of the blockade, I think is apparently benching on the fact the memory of the public, the journalists, and the politicians is very short. "The true crisis with the Turks broke out during Operation Cast Lead. The Goldstone commission was established after Cast Lead, and we never blamed the previous government. We are doing the best we can in order to ward this off. We are not doing too badly, in my opinion. This whole celebration of hypocrisy – sometimes you ask yourself how far it will go, how far are they prepared to go because of lust for power and the desire to sit in the minister's chair?" See all talkbacks "Lieberman defends PR, slams opposition"